Incredibly snuggly, this quick-crochet cowl will warm you up in no time! I designed this cowl to have a chic and trendy style, while keeping the pattern easy enough for the beginning crocheter. (No lie: this cowl is a perfect “First Project” if you’ve always wanted to learn how to crochet.) Make one in a bold color to brighten up your winter coat and chase away winter drab. Then make a stack for everyone on your Christmas list. You’ll be a Crochet Rock Star. Yarn: Sensations Yarns Sumptuous (100% acrylic; 86 yards [79 meters] /198 grams [7 oz]): Purple, 2 skeins. Row 1: dc into each ch of your foundation row. (80 dcs completed.) Sl st into top of ch 2. Ch 1. Row 2: sc into each dc of previous row. (80 scs. completed.) Sl st into top of ch1. Ch 2. Anne! My list of things to crochet is already too long! You just had to come up with another cool pattern for me to work on? But this one is fast and easy, so it shouldn’t hurt your queue too badly! This looks great Anne good to know your still out there crocheting I had been checking for your uploads this is great for warmness and christmas gifts! This is wonderful! Could you please tell me if it is mobius or not? If not, could you please tell me if there is a way to make it mobius? Hi Melea! This cowl is crocheted in one continuous loop (sometimes called an “infinity” or “eternity” scarf). I think math people get a little fussy about misuse of the word “mobius,” so I won’t oficially call it that. (Math people can turn really mean.) BUt it IS a continuous loop. I hope that helps! for the yarn, is it in the category medium, bulky, super bulky? I just have access to Bernat and Red Heart so what is equivalent for the size of the yarn? Thanks, I just love your pattern!!!! That’s a great question, too. This yarn is super bulky. A good equivilent in Red Heart might be “Boutique Cosmic” (with two strands held together to get a similar gauge) or Bernat’s “Baby Blanket” (with two strands held together to get a similar gauge). You could also try using five stands of any worsted weight yarn. I haven’t tried it with this pattern, but doing the math, I think that would work, as well. Just great! Thank you very much!!!! This was a question I was going to ask, too. Thank you, thank you! ☺ So lovely and thank you for sharing with us!! To say I am a beginner is an understatement! I want to try this pattern, but the crochet lingo is like Japanese to me 🙂 Any advice for me? Thank you for your comment and Welcome to the World of Crochet! (It’s cozy here!) If you want to start crocheting, my best advice would be to find a nice crocheter you know and learn the basics with a friendly lesson. Crocheting is NOT hard, but I had a hard time learning from a book. Everything clicked when I was able to watch my friend Jill crochet LIVE. A few stitches and a few corrections and you would get it quickly, I bet. But if you don’t know any crocheters, here is a link from Purl Bee that shows step-by-step pictures for the first basics stitches: http://www.purlbee.com/crochet-basics/. After that, check out YouTube for more advanced techniques, and then there’ll be no stopping you. Blessings on your first crochet project! I just ad a quick question , is this pattern supposed to be wrapped around twice? i hope you know what i mean by that! lol… I absolutely love this pattern, it is so simple and so beautiful at the same time! Hi Tara! I’m glad you like this pattern – it’s one of my favorites! I wrap this cowl around twice. Happy Crocheting! Thank you for your comment. I’m glad it is such a quick project! Thank you so much for following. Can I use any type of yarn that is thick? Hi! Great question 🙂 You can use lots of thick yarns for this project, but if they are much thinner than the super-bulky yarn used here, you would have to change a few things. If the yarn you’re using is a “6” (super-bulky) thickness, then you should be able to use a Q hook and get a similar look. If it’s a “5” (bulky) thickness, I would recommend dropping down to a P hook and adding a few rows. Either way, and most importantly, make up a swatch and adjust the number of stitches you chain to match the dimensions of the pattern, as needed. I hope this helps a bit. It’s actually a great and helpful piece of information. I am glad that you shared this helpful info with us. Please stay us up to date like this. Thanks for sharing. Your pattern calls for a Q hook what is the equivelant in metric? I would love to make this for my granddaughter I know she would love it. Hi! It looks like the Q hook has a metric equivilent of 15.75 mm or 16mm. Hope that helps! I hope your granddaughter loves this cowl, too! Yes, but with modifications to the pattern. To make a cowl with the same dimensions as in the pattern, you would certainly need to add more chains to your foundation row, and you would need to add a couple more rows. A 4″ swatch will give you your new gauge, and from there it’s just a little math – good luck! I’m sure it will be beautiful! Hello, is the scarf to be worn hanging around the neck or can it be pulled over the head like a hood, or snug like a scarf. Is the yarn a size #6 bulky like lion brand thick & quick? This might be a completely blonde question, but just trying to work out how many stitches to do….the biggest hook I have here is a 9mm one. 4 inches requires 15 chains with the wool I’m using, does that mean I should times everything by 3? So my foundation chain needs to 240 chains? I just want to make sure I’m working that out right before I end up in a tangled mess! Thanks! Oh and I can’t wait to see the finished product, yours looks great!! Not a dumb question, in fact this one’s about “getting gauge” – and it’s a seriously good question. To figure out your pattern using a different hook, you’ll need to make a swatch first. I like to crochet a square about 6″ big. (Unless directed otherwise, you’ll want to make your swatch in the same pattern as the project. 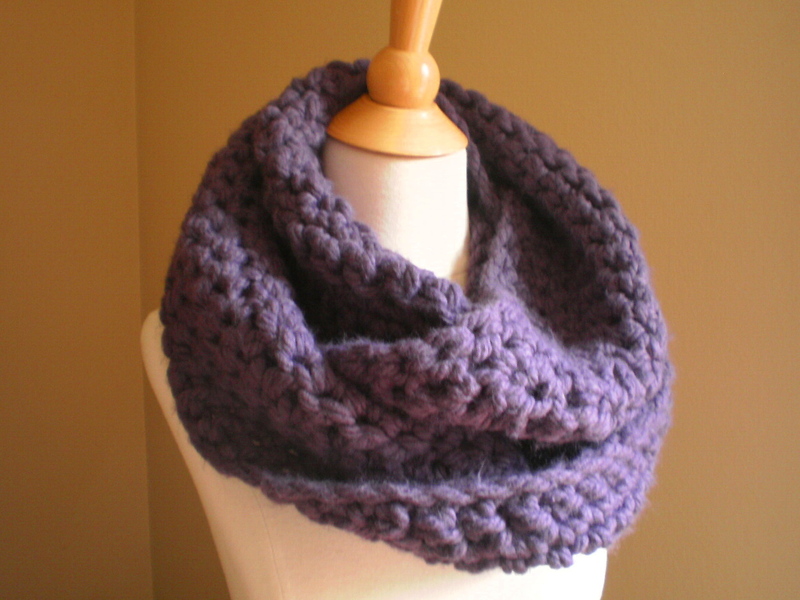 For this cowl, you can work your swatch in sc.) Then to find your gauge, you’ll measure how many stitched per inch, both across (sts per in) and vertically (rows per in.). (I measure a 4″ section and divide the stitches from that – it’s more accurate than looking at a single inch.) So let’s say you measure your gauge as 3 sts per in. To make a cowl that’s 64″ around, you’ll need to chain 192 ch. for your foundation chain. (64 x 3 = 192). So, take the time to crochet up a quick swatch – just counting chains will not give you an accurate gauge. I hope that helps – Happy Crocheting! Hi! 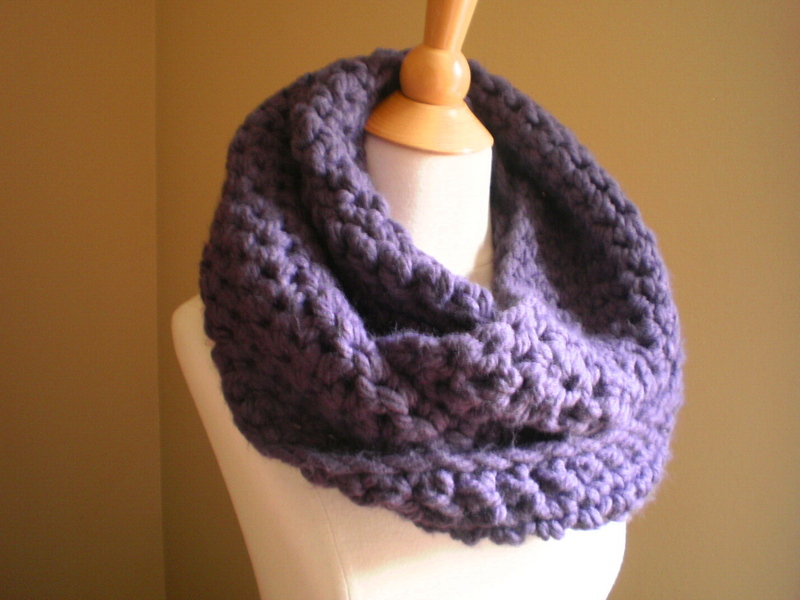 Just found this today through Pinterest and it’s exactly what I’ve been looking for, an easy bulky cowl pattern! I have a lovely skein of hand dyed super bulky merino I’d love to use. It has 140 yards on it, do you think that would be enough? Glad you like the pattern! I think you may be a little short with the yarn you have, you’ll definitely be cutting it close. The pattern calls for 172 yards of yarn, but I can’t remember how much left over I had when I finished. Thirty yards? MAYbe. If you don’t have quite enough yarn you could adjust the pattern, by just working 3 total repeats of row 1 and 2 (and then finish with another row 1). It wouldn’t make as wide of a cowl, but it would keep it just as long. Hope that yarn makes it though! You’ll ch2 (counts as your first dc) and dc into the THIRD ch from your hook (this counts as your second dc). This is the trickiest part, though! After you have established this first row of stitches, you will keep yourself on track by making sure that each stitch aligns with a stitch below it in the previous row.